These are the items I'm taking for a week in Crete in late September. 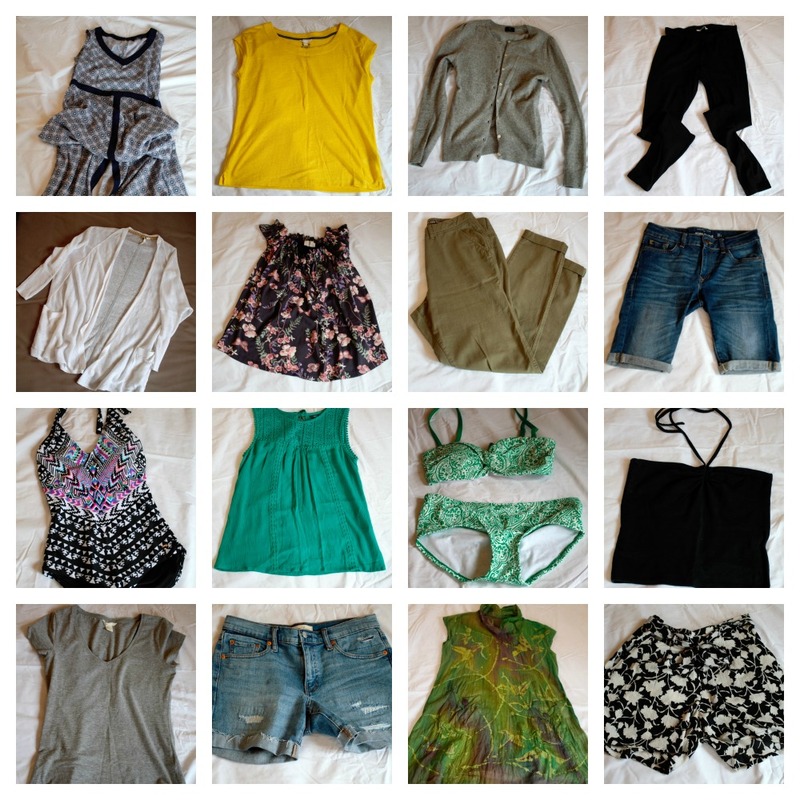 My holiday wardrobe contains: 3 pairs of shorts; 1 pair of leggings; 1 pair of khaki trousers; 1 maxi dress; 1 tunic dress; 2 cardigans (1 warm for the plane and 1 a light linen mix); 5 tops; 1 bikini; 1 swimsuit; 2 scarves; 3 items of footwear; and 2 bags. Other items I've packed but not photographed are: 1 pac a mac; 1 pair of sunglasses; 1 hat; a small selection of jewellery; and 1 belt. For the plane journeys I'll wear the green trousers, grey t-shirt, grey cashmere cardigan, blue converse pumps and jade scarf. These layers should give me enough warmth but can also be used again for the holiday. All the items have been chosen to mix and match and most are quite loose fitting. This weighs in at less than 10 kg which is a lot lighter than what I've previously packed for a holiday in the sun. It's not as minimal as some travel wardrobes but it's definitely progress for me. 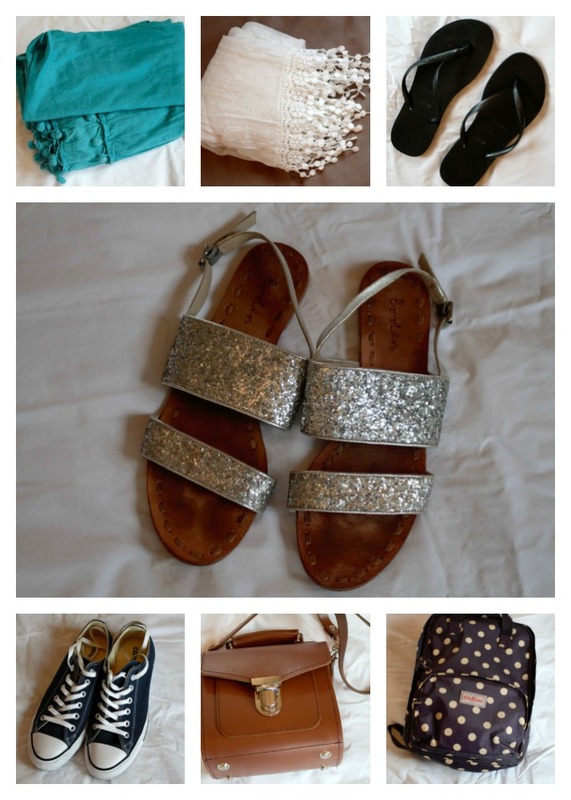 I've tried to limit my holiday clothing whilst also allowing for some dressing up fun (hello silver sandals). Also, I'm hoping to learn from this packing experience and I'll report back on what I wore the most. Have a great week - I'll be back to update you soon. Have a great holiday and let us know how it went - did you wear and really need everything?! Your packing is envious! We've just returned from a week in Cornwall and as usual I only wore a third of the clothes I packed. Will I ever learn. Have a lovely holiday! Enjoy your time in Crete, Claire. Your travel wardrobe looks to cover every type of event and your choice of colours work well together. Hope you have a great time. It will be interesting to come back and see how good the wardrobe choices proved to be. So happy to have a new tablet and eventually catch up with my favourite blogs! On my last trip abroad, I failed to wear 2 items out of about 20, so I am (slowly) getting better at this too!